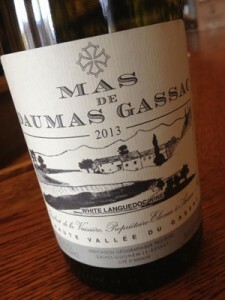 2013 Mas de Daumas Gassac, Haut Vallee du Gassac Blanc, L’ Herault Languedoc White, France. This has become an iconic wine of the the south of France with an exotic blend of varietals that make it totally unique in character. The lovely and stylish Gassac Blanc is a blend of Chardonnay 25%, Viognier 25%, Petite Manseng 25% and Chenin Blanc 25% which add up to a white that has mix of flavors that take you from Condrieu to Chassagne and to Montlouis in the Loire with a bit of Jurancon thrown in! This layered wine, about 13% alcohol, starts with white flowers, hazelnut, clarified cream, brioche and wild peach with tangerine and lemon bursting through on the mid palate. The core opens to apple, pear, tropical essence, dried honey and apricot with liquid mineral, chalk and toasty notes that flow seamlessly and fill the mouth with refined textural feel and class, without question this is gorgeous wine. While expensive and a touch annoyingly arrogant, I can’t help but love the Mas de Daumas Gassac “Grand Cru of the Languedoc” wines, both this one and their Cabernet based red, though this 2013 Blanc might be the best offering to date and should drink well for a decade, best from 2015 to 2022, it is pretty damn good!